With a pot of tea, a slice of cake, sit back in a deep arm chair around 14.30 GMT and set the co-ordinates (in theUK) to Channel 120. It’s that time of year again – all blue and gold and silver, yellow and red. 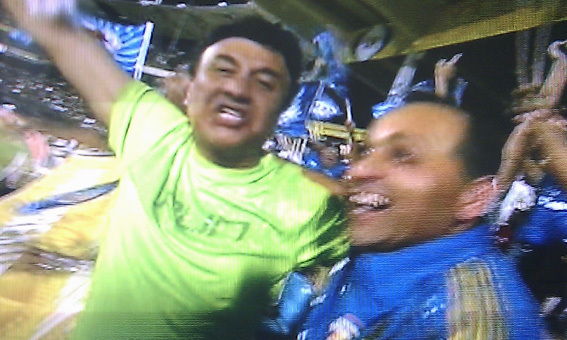 It’s IPL 2012 from Chennai and look, there’s our old friends, Malinga, Sachin, Bhaji, Raina, Vijay and the rest of the troupe. The circus is in town. Their opponents, Chennai, on the other hand were jet-lagged from partying in SA for the benefit of Jacque Kallis, sluggish and as slow as an England Football side in the opening match of a World Cup tournament. Their ground staff had ‘helpfully’ prepared something special for the opening match. 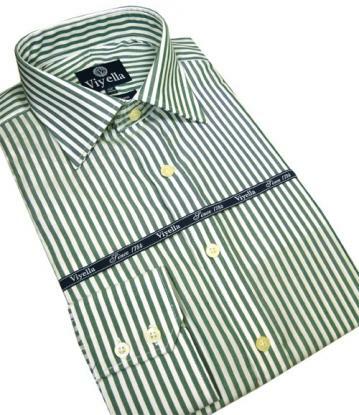 The resulting wicket looked like a green Bengal striped shirt with variable pace and bounce to unsettle and humble the great gladiators who, in their BAE Air Buses, bestride the cricketing world. Dear Bhaji has found new confidence and purpose as captain of the Indians and he brought obvious relish and leadership to the role, with positive, involving, encouraging body language and support for his bowlers and fielders, who responded with élan and éclat. The Indian’s throwing had the zip of a Wild Bill Hickok knife-throwing act. Three run outs soiled the shirts of the diving, despairing Super Kings and knocked the stuffing out of them. The debased champions, hobbled from the field for a miserable 112, the spoils of the engagement shared equitably by Pollard 2-15, Malinga 2-16 and Ojha 2-17. Thus they made way for Tendulka and Levi and annihilation. Richard Levi, who makes Dave Warner look like the skinny kid on the beach, plants his left foot across to the off stump line and from this vantage point pulls every ball to leg like a meteor. Chennai could have set a 9 – 0 field had they not realised they might need one somewhere on the off to take a catch if the Protean ever assayed one of these pulls from too wide of the off-stump. But when this did come to pass, Levi had already made 50 off 35 balls having crashed 6 fours and 3 sixes. He also enjoyed a Master Class from TLM (The Little Master) 20 yards away at the other end. Sachin interspersed tips and advice for Levi with SUBLIME shots off front and back feet. Who knows, with the monkey of the 100th hundred off his back, fans may about to witness a golden sunset or even an ‘Indian Summer’ from this extraordinary batsman. That said, when a ball flew off one of the green Bengal stripes on the wicket, crashed into and brought blood gushing from TLM’s bottom hand forcing him to leave the field, we were reminded that, however exceptional and heroic, Tendulka like Hercules, is made from clay. 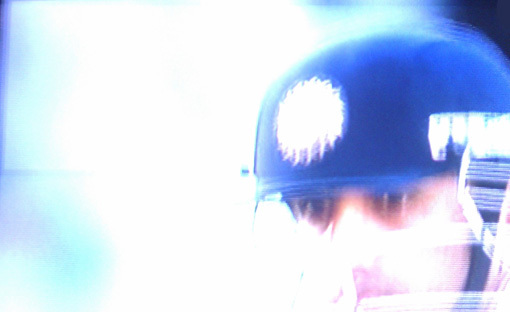 Meanwhile in Columbo, Kevin Pietersen appears to have caught the IPL bug. It is that time of year! What’s not to like about Michael Clarke – apart from the tattoos and a tendency to get out just before major intervals? At the end of day two of the Sydney Test, he is 251 not out (31 x 4s and 1 x 6) and all day his grin was as broad as his bat. 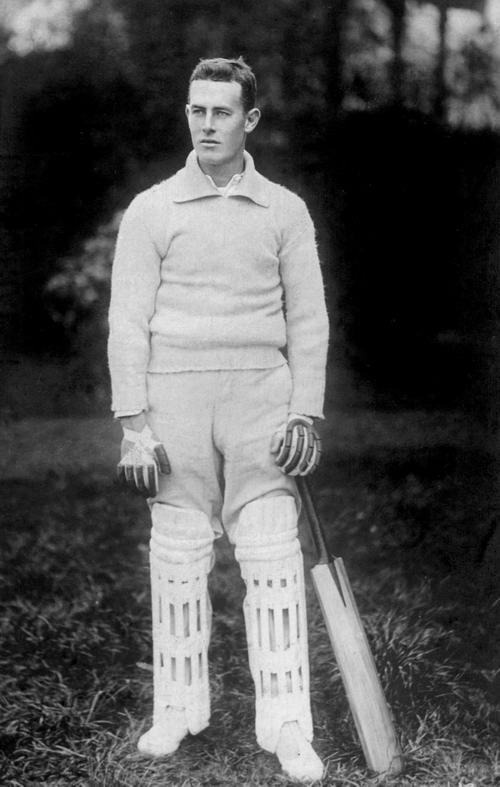 Clarke has grown several inches taller under the weight of the captaincy which may account for the fact that he did not look like giving way to any last-over-of-the-day lapse in concentration and therefore will reappear from that grand old pavilion on day three as fresh as a daisy with enough time in the game to amass a mammoth score without being in anyway selfish. Clarke is already the highest scoring Australian at the SCG in a Test and has in his sights the 287 notched up by Worcester and England’s R.E. 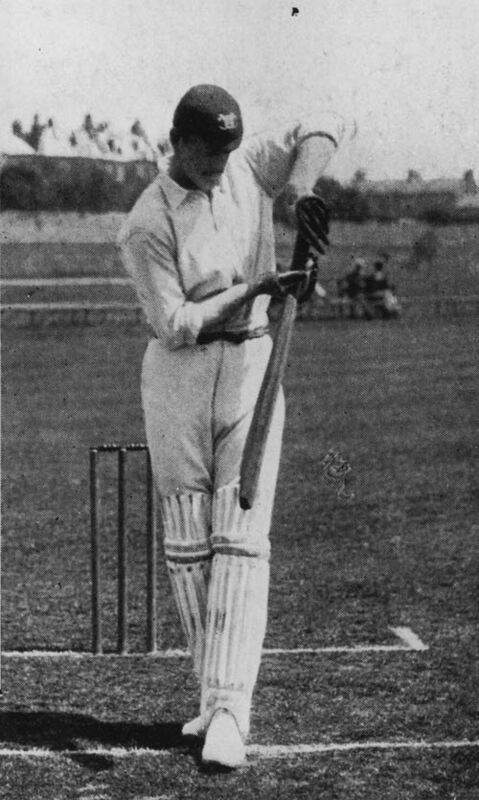 (Tip) Foster (shown right tucking one away to leg) in the First Test of the 1903 series. Foster, like Clarke, batted that day at Number 5, came in at 73 for 3 (not dissimilar to Clarke entering the fray at 37 for 3). Foster ended his first day at the crease on 73; Clarke on 47; but the English had laboured all of for three hours in this the first phase of his innings. Next morning, with the wicket playing faster, ‘Tip’ moved up a gear to reach his first century. There followed a collapse at the other. Foster, with Relf as his partner counter attacked, scoring 94 between lunch and tea. At Relf’s departure, Foster was joined by Rhodes in a record for the last wicket of 130 in 66 minutes before being caught by Noble off Saunders 13 short of the triple. However, when Australia began their second innings 292 runs behind the visitors, Foster’s great innings was eclipsed by one from Victor Trumper who, batting at Number 5 (quelle surprise!) made a sensational 185. 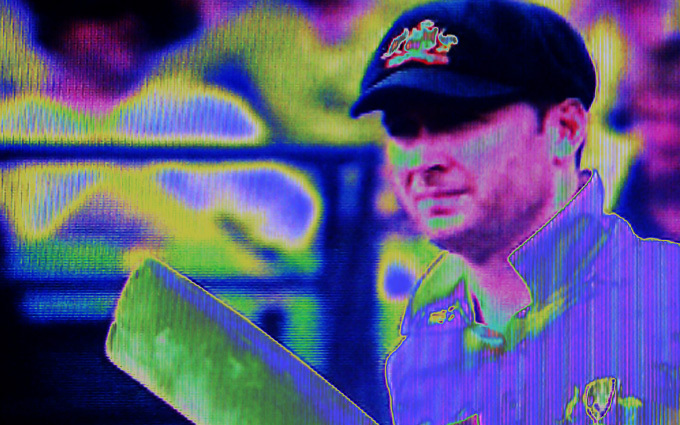 Although time-bound readers of this blog will not have seen Victor Trumper bat, it is just possible that they will have come close to that experience if they have been fortunate enough to see Michael Clarke bat today. Light and quick of foot. Check. Wonderful front foot driving. Check. Deft cuts. Check. Savage cuts. Check. Infectious enjoyment. Check. Mastery. Check. The ability to make the sunshine on a cloudy day. Check. Trumper reached his hundred in 94 minutes. The written-off Ricky Ponting wrote himself back in with an innings of 134, which on any other day would have deserved a piece to itself, but as Foster discovered nearly 110 years ago, even a very good innings can be totally eclipsed. One supposes that the only thing that could possibly trump (sorry) a big-triple from Clarke would be Tendulka scoring that hundredth hundred. 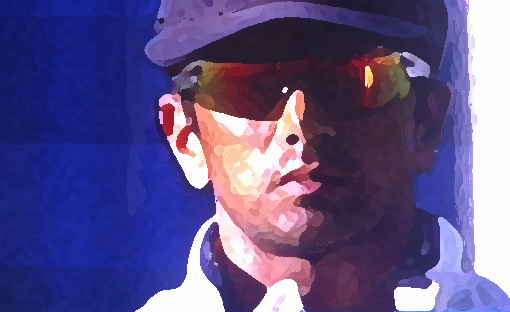 If Third Man was MS Dhoni, he’d bat the little master at number 5 to make sure. N.B. Prior to Clar*e’s innings today, an Australian’s top Test score at the SCG was Doug Walter’s 242 v the West Indies in 1969 ,batting – you guessed it – number 5.
courtyard pavements were smashed; the work of giants is decaying. remained standing under storms; the high wide gate has collapsed. An archaeologist at work at the Oval yesterday surveying the third day of the fourth Test match between England and India would have seen a single wall, upright and unscathed by anything that time had thrown or bowled at it, evidence of the considerable skill and craftsmanship of a great civilization. About the base of the wall he would have noticed fallen columns, single capping stones, dismantled steps, smashed arches and overturned cornices littering the ground; evidence of the destruction wielded against that civilization by some invading storm of vandals. This was not another find of the remnants of the Indian bowling, but the relics of the once great cultural expression of cricket which was Indian batting whose lyric verse no cricket lover can have ever tired of enjoying. 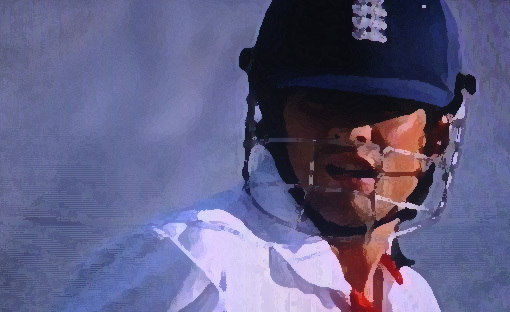 Rain took nearly four hours of time out of the day’s play but this forced England to declare at 591 for 6. Bell had reached his first ‘double’ in Test cricket before perishing to the sweep against Raina for 235 (in 487 minutes and 364 balls). Morgan had damaged his Test match reputation a little further and Bopara had done all that was required of him in personally testing circumstances. India sheltered in their dressing room throughout the delay in play, either recovering from the pummelling they had received in the field or in dread of the pummelling they were about to receive when batting, or both. England in contrast manifested their testosterone when going through their full pre-match preparations on the drying outfield. Once again the Indiam batting line up had to be altered as Gambhir recovered from a concussion acquired when thumping the back of his head very hard as he stumbled backwards in a failed attempt at a catch the day before. This necessitated Dravid opening once more, but it should not necessarily have necessitated VVS Laxman batting at number three again, but inexplicably it did. Sehwag taking first strike untypically watched a couple of deliveries from Anderson go down the off-side before hitting the next two to the boundary in a more typical Sehwagian fashion. All hearts were raised by the hope of witnessing this special batsman lead India’s counter attack against the Vandal horde, but Anderson was setting him up for the one that comes back and he was duly trapped LBW like a novice. Laxman was accordingly sacrificed like some gambit with a pawn. Who exactly is responsible for squandering the potential of this great middle order batsman against the new ball? Tendulka arrived to another standing ovation as the crowd, keen to the history of events, willed him to the rather artificial milestone (or millstone) of a hundred international hundreds. This giant of all-time was all-care and all-attention but he was twice struck ducking under balls that were not that short, once on the helmet and once in the ribs. It was an uncharacteristic awkwardness and discomfit, but he met the blow to his head with an embarrassed smile and then a perfect on-drive for four. All might be well, thought the historically minded crowd. But an all-or-nothing sweep him off his length approach to Swann, who came on to bowl salivating like one of Pavlov’s dogs, was fraught with danger. He must have calculated that the risk was worth it. 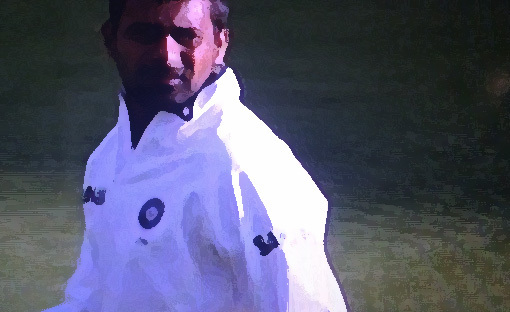 It revealed the Indian estimation of the wicket and the threat that the off-spinner presents, but the odds were always against it answering the destructive challenge of Swann the Terrible, and it was not long before Sachin bent his knee again and gloved the ball over his head to a waiting slip. All who slaver are not fools. Raina’s humiliation continued with a 40 minute duck that showed him confounded by movement and then lured by flight to over-balance and be stumped by a quick handed Prior, the batsman’s toe finding only a precarious perch on the line. England took 5 Indian wickets in two hours (including a nightwatchman). Fifteen therefore remain to be demolished and reduced to rubble by England in two days. Swann’s figures are 10 overs, three maidens, 3 for 27. The Wall remains 57, the only lasting evidence of a shattered civilization. * extract from “The Ruin“, an 8th-century Old English poem from the Exeter Book by an unknown author. N.B. The Squire has been called to Town and Third Man’s valeting services are required. His Grace has not revealed whether this journey is in response to a call from the Governor of the Bank of England, a secretive someone in Downing Street or Duncan Fletcher, but further morning reports of deeds at the Oval will not be forth coming. During the course of the third day of the second Test between England and India, the Indian bowlers were well and truly beaten. England began what for them should have been an anxious day 43 runs behind India with one wicket down and an important batsman, Trott, hors de combat. But they ended it having scored 417 runs for the loss of only 5 wickets with a total of 441 for 6 – giving them a startling and commanding lead of 374 with more to come. After Strauss had been unhorsed with the lost ground yet to be retaken, Bell first and Pietersen later made a mockery of the perceived difficulties of the batting conditions. There followed a day of carnage and mayhem. As soon as India had unseated one opponent his replacement picked up the fallen lance and took forward the advance with yet more zeal and vigour. In England’s list the pugnacious Swann comes into the tilt-yard at 10 and the belligerent Broad, who transformed England’s fortunes in their first innings, has yet to bat. It is the interminable belligerence of the batting, with its ricochet of the West Indians and the Australians in their pomp, that will have done so much psychological injury to India. Theirs was a weakened bowling attack. Not only is Khan missing, but Singh was unable to bowl more than 9 half-hearted overs at a stage in the match when a physically and mentally robust spinner should have bowled 30 or 40. Yet, the dismissal of Trott caught off the gloves from a steeply rising delivery from Kumar that was a repeat of one earlier in the day which bounced over the gloves of Dhoni standing up to the same bowler, is evidence that the spite has not been rolled and baked out of this wicket entirely. 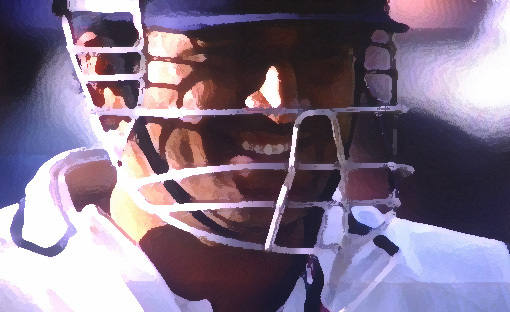 However, the day will be remembered for an incident that occurred from the final delivery before tea when Morgan hit the ball to the midwicket boundary and, owing to a mixture of the confusion caused unintentionally by the boundary fielder, Kumar, and the tiredness and sudden break in concentration on the part of Bell (137 at the time), the batsman left his ground for the sanctuary of tea, believing the ball to have gone for four and thus to be ‘dead’. Kumar unsure whether the ball had reached the ‘ropes’ returned the ball in leisurely fashion, via the wicket keeper, to short leg who calmly removed the bails and appealed. Bell was given out amid the taunts and jeers of an unattractive crowd whose belligerence easily matched that of England’s batting. Foot soldiers will say that the valid appeal should have stood. 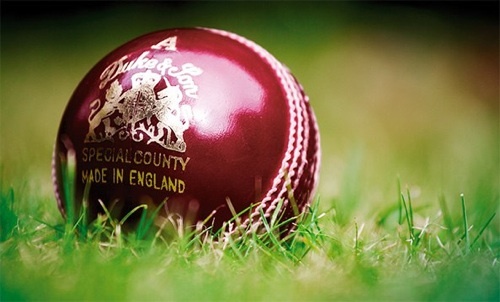 The cavalry will say that Bell’s error was a misunderstanding and therefore, in the spirit in which cricket is played, the appeal should have been withdrawn. Following a visit to the Indian dressing room by Strauss and Flower, Dhoni, with the support of his side, chivalrously withdrew the appeal and Bell resumed his assault on the Indian bowling after an interval extended by this diplomacy. Whether this incident adversely affected the performance of India in the final session or whether it was plain exhaustion, England plundered 187 runs after tea with Prior hacking 64 in 55 balls and Bresnan 47 in 66. But chivalry is also a social mechanism for the avoidance of blood-and-treasure-sapping feuds, and the maintenance of dignity amongst a self-preserving elite. Without questioning the upright motives of India’s senior players, who clearly felt a deep unease at the nature of Bell’s dismissal, the decision was made against the background hubub of a crowd making naked its aggressive intent and the buzz of half the commentariat who were already challenging the honour of this tourney’s visiting combatants. After his innings of 159, Bell can place his lineage without presumption beside that of Tendulka, Dravid and Laxman in the Peerage – a high rank indeed. The prospect is dark for India, but these esteemed knights and their fellows will tell themselves that in cricket the batsmen must be beaten too. The Law of Large Numbers operated yesterday as India failed to hold out against England for the prescribed number of overs remaining in the first Test or to score that other large number, 457, needed to win the match. As anticipated the expected value of the Champion’s second innings was drawn towards the average of the results in what is now a sample of 2000 similar experiments. Their score of 261 runs in 93.3 overs was normally distributed about the mean and gave encouragement to the Central Limit Theorists hunched over their calculators sheltered under the canvas bell tents atop the new Mound Stand. It was never going to be enough and, with the final Indian wicket falling 28.3 overs before the scheduled end of this Test, England were home and hosed (by the old crone of Clicquot) well before the shadow of the Warner Stand could creep over this famous playing surface on which neither Tendulka nor Laxman have achieved triple figures. No Game Changer emerged from the pack of overcooked, undercooked, ill and injured Indian players. They fought the Law, and the Law won. Lady Luck had not been on their side. Inserting England on that first morning, they were making progress when Khan (undercooked) pulled up lame. Then, bad light and rain intervened to shield England from the worst of the batting conditions. 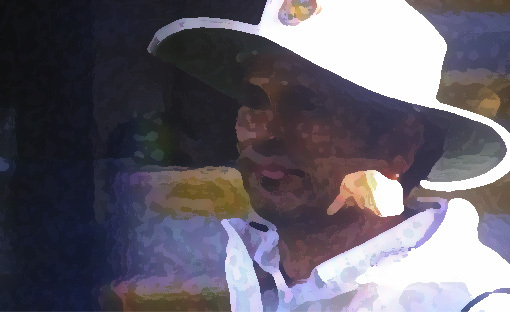 Timorous umpiring and the good sportsmanship of Dravid allowed Pietersen to escape and add a further 150 runs to his score – close to the ultimate statistical difference between the two sides. Tendulka (overcooked) was beset with a virus that disrupted the settled batting order and the disposition of Gambhir, struck on the elbow while fielding at short leg, caused further disturbance and limitation. Sehwag is not here, timing his absence for surgery to the demands of the IPL calendar. The majority of these set backs will persist as the Indian motor-coach takes the M1 north to Nottingham where the second Test starts with only a three day breather. The champions are in a difficult place. Their captain, who Sunny Gavaskar says has ‘a life-line running up to his armpit’ is exploring every inch of this portent. The reputation of their motivator-coach, Duncan Fletcher, is balanced precariously on the top of a steep and pinnacled normal distribution. After a night in their hotel, a balanced, focused and primed England team will make their way north to Trent Bridge where their ‘game’ will be even more suited to the conditions.